The kids are on fire in the bedroom. In a recent Tumblr post, one of my online pals, the talented musician and music writer Douglas Martin, reminded readers of an old Calvin & Hobbes comic strip that was particularly astute on the subject of shock value in music. Calvin & Hobbes holds a place close to my heart for way more reasons than I can probably articulate right now; probably a big part of it is the way Bill Watterson was able to do something so imaginative, singular, and emotionally resonant and also succeed commercially, and then walk away when he felt like he was being made to compromise too much. Like a lot of people, I once had to spend some scary times in a hospital, and I remember a head specialist at Vanderbilt University Medical Center telling a 13-year-old me and my parents about all kinds of gruesome things they might have to do with me, including possibly cutting me open or else risking some kind of cerebral explosion years down the line (fortunately none of this happened and the dude just had really awful bedside manner); at some point he and I were able to bond over a reference to Calvin & Hobbes, the only human connection in our entire scary conversation. Earlier, my friends when I was in elementary school all used to read Calvin & Hobbes, too, and we would draw our own characters, envision our own universes in between playing kickball or trading baseball cards. So my love of Calvin & Hobbes might have something to do with all that stuff, too. According to the Des Moines Register, a record 25,000 fans went to Lazerfest in Indianola on Sunday to see Alice Cooper, Rob Zombie, and Godsmack (although it sounds like the crowd had thinned out a bit by Godsmack). No matter how you feel about the acts involved, if you care about live music in the Des Moines area, that's awesome, and huge kudos to the people who put the event together. In a really interesting interview with the Register's Joe Lawler, Cooper basically brags about what this Watterson strip decries, putting a hip postmodern self-awareness on being a typical golf-loving Arizona Republican who occasionally, like a carnie finding his mark (and these days in some of the same venues, probably, right?) gets earnest young kids to part with their heard-earned money to see him do his best PT Barnum: "Jim Morrison trying to be Jim Morrison all the time is what killed him. Why not leave that character on stage? That's what allows me to be married, have kids and coach Little League baseball. When I get on stage, I play a character that's nothing like me: an arrogant, over-the-top, egotistical villain. That's what makes it fun. I'm sure Anthony Hopkins feels the same about Hannibal Lecter." Whatever, it's all show business. But it's nice when that rare talent like Watterson can entertain you and tell you something true, too. Beauty is truth, and vice versa, etc., and all that. 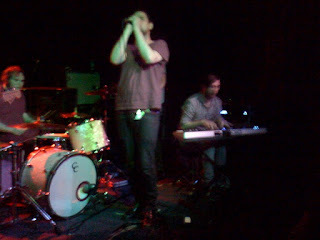 I doubt many people at Lazerfest experienced anything as heavy as they would've felt standing in front of the speaker for the The Twilight Sad's set at Vaudeville Mews on Tuesday night. I thought there was another opener on before them, so a friend had to text me during the first song, and in my rush to get over there I forgot to grab earplugs. I vividly remember squinting because of the gale-force distortion, which doesn't even really make sense. The Twilight Sad are a band from Scotland, and their name almost describes what they're like, if you can use some imagination: jet-engine guitar effects and wobbling vibrato evoking My Bloody Valentine (that pink Loveless cover looks sort of like a pretty sunset, right? ), plus a whole lot of sad in the form of lead singer James Graham, who burrs barely comprehensible (to American-accented ears) lyrics about adolescent pain and adult drunken anguish, often while closing his eyes. The Twilight Sad have two albums out now, 2007's Fourteen Autumns & Fifteen Winters and 2009's Forget the Night Ahead, and they played songs from both of them; here's something I wrote about them in 2006. Not that many people were there yet, and I suppose if you didn't know the songs it would've been hard to figure out what Graham was getting at over the racket, but somehow I'd never seen the band live before, and I was pleased to see they could make the same sound happen onstage. Only louder. Japan's Mono were the headliners, and they gave the 95 or so paid attendees their 15 dollars' worth with a 90-minute set of brooding, dynamics-driven post-rock instrumentals. In general I might not be the go-to guy to go around critiquing post-rock-- when Mark Richardson and I went to a festival together, he was the one who got to write about Mogwai-- and I was running low on sleep at this point, so it doesn't say much that my attention was lagging from time to time. Mono were as intently focused on their instruments as classical musicians, and they seemed as expert, too, shifting from hushed to cacophonous in ornate bursts of melody, their long hair flapping in the air. Good stuff, but at the same time it reminded me that local instrumental rockers the Autumn Project are pretty damn great at this type of thing, too. I am definitely gonna be at the Mountain Goats show in Iowa City! this is a great write up, sounds like a great time!